‘In the approach to woman as the spoil and handmaid of communal lust is expressed the infinite degradation in which man exists for himself, for the secret of this approach has its unambiguous decisive, plain and undisguised expression in the relation of man to woman and in the manner in which the direct and natural procreative relationship is conceived. The direct, natural, and necessary relation of person to person is the relation of man to woman. In this natural relationship of the sexes man’s relation to nature is immediately his relation to man, just as his relation to man is immediately his relation to nature – his own natural function.’ (EPM pp.100-01. Italics in the original). ‘The premises from which we begin are not arbitrary ones, not dogmas, but real premises from which abstraction can only be made in the imagination. They are the real individuals, their activity and the material conditions under which they live, both those which they find already existing and those produced by their activity. These premises can thus be verified in a purely empirical way. Here is a purely objective way of viewing things, not from the angle of consumption, but from that of production. Consumption does not occupy any significant place in the Marxian model of studying human societies, whether pre-capitalist or capitalist. All this amply proves how Marx viewed the function of food not merely as a means of subsistence but also as a human product, something to be enjoyed only when one is eating not just because one is hungry but because one is prepared to appreciate the art of cuisine as well as the appearance of the dishes to please the eye. In other words, only by transcending the basic natural need for food that human kind can really achieve the aesthetic and truly human enjoyment. It is neither the gourmet nor the gourmand that Marx approves of. Food should have a properly human relationship to all humans, who do not suffer from hunger and can enjoy their food as a human product. Already among these precursors of the movement we notice an asceticism which is to be found in all mediaeval uprisings that were tinged with religion, and also in modern times at the beginning of every proletarian movement. This austerity of behaviour, this insistence on relinquishing all enjoyment of life, contrasts the ruling classes with the principle of Spartan equality. Nevertheless, it is a necessary transitional stage, without which the lowest strata of society could never start a movement. In order to develop revolutionary energy, in order to become conscious of their own hostile position towards all other elements of society, in order to concentrate as a class, the lower strata of society must begin with stripping themselves of everything that could reconcile them to the existing system of society. They must renounce all pleasures which would make their subdued position in the least tolerable and of which even the severest pressure could not deprive them. Notwithstanding this striking feature, asceticism cannot be a part of the communist programme as Marx and Engels envisaged it. But a negation of asceticism and abstinence does not necessarily lead to an assertion of the other extreme: eating and drinking and making merriment are the sole aims of life. In fact, given Marx’s views of the future communist society, it is conceivable that he wanted to steer a middle course between unlimited consumption and total abstinence, the golden mean that would make human life happy without overindulgence either in too much of sensual enjoyment or scrupulously avoiding all pleasures. 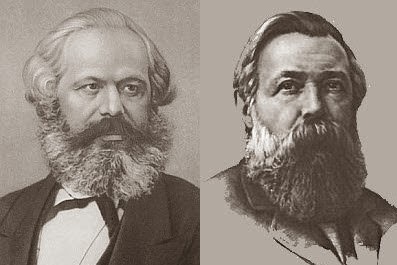 Marx and Engels preferred to see humans not as isolated individuals but as units in a well-organized society. They would all get whatever they need (and needs would obviously vary from person to person, depending on each one’s circumstances) and they would contribute to social welfare to the best of their ability. Marx formulated the goal of communism in his Critique of the Gotha Programme: ‘From each according to his ability, to each according to his needs!’ (Moscow ed. p.22; Peking ed. p.17) Such a society would demand rational men and women, not trying to keep up with the Joneses; on the other hand, they should be conscious of others’ needs, not only of their own. Consumption would be based o rational choice, not on what ‘the hidden persuaders’ (in Packard’s words) would make them do. Since there would be neither any status (as in the pre-capitalist societies) nor any class division (as it prevailed in all human societies after the dissolution of the pre-class society, otherwise known as ‘primitive communism’), both consumption and production would be organized on rational lines. Self-enjoyment at the cost of others would have no room in such a society. In view of all this, Timpanaro’s advocacy for hedonism as inhering in materialism (including Marx’s) seems to be not only ill-conceived, but also harmful to the understanding of the socio-philosophical basis of communism. Materialism to many has one and only one meaning: ‘a tendency to consider material possession and physical comfort as more important than spiritual values’ (as given in the Concise Oxford English Dictionary). The other meaning, ‘Philosophy the doctrine that nothing exists except matter and its movements and modifications,’ is seldom noted and understood. By equating materialist ethics with hedonism Timpanaro has strengthened the hands of the anti-materialists and fideists. Instead of throwing light on the matter, he has made the confusion worse confounded. I just wanted to extend my thanks for what I consider to be your major contribution to a fundamental issue. Timpanaro comes up in something I'm now putting together, and my take is similar to yours, except that I bring in "species being" to make more specific how one transcends the limitations of the self taken in hypothetical isolation.